The world's best restaurants - how does Australia rate? I was leafing through a copy of Vogue in the hairdresser’s this morning and it struck me that there’s a whole world out there that is simply not the one I inhabit. It’s a world where paying more than $4,000 for a pair of designer sneakers – yes, sneakers – is not only possible but de rigeur. In that world, you can pop in to the Grand Hyatt Martinez in Cannes, at around $2500 a night, for a quick getaway. And it doesn’t faze you to stump up $50 or so for a cappuccino (complete with real gold leaf sprinkles) at the Emirates Palace Hotel. These are the readers Elite Traveler magazine caters to. And I’ve just received their press release naming three Sydney restaurants among their 100 Top Restaurants of the World. Their list of the world’s best restaurants is decided by a reader poll and in 2016 has put Sydney among the top dining destinations in the world – after New York, Paris, London and Tokyo. Sydney’s Quay has moved up 20 places this year to number 77. And two other Sydney establishments, Tetsuya Wakuda’s eponymous establishment and Martin Benn’s Sepia squeak in at number 97 and number 99 respectively. “Martin Benn’s European-Asian reflects how Sydney’s rich ethnic diversity has produced one of the most exciting and multicultural gastronomic cities in the world,” the release says. What they failed to mention is that two Melbourne establishments out-ranked all three Sydney venues. Vue de Monde climbed 14 places to number 67, while Attica was hard on its heels at number 70. The list is created from the votes of The Diners Club® World’s 50 Best Restaurants Academy, comprising almost 1,000 international restaurant industry experts. The Academy is split into 27 separate regions around the world. Each region has its own voting panel of 36 members including a chairperson to head it up. The panel in each region is made up of food writers and critics, chefs, restaurateurs and well-travelled gourmets, each of whom has seven votes. Of those seven, at least three must be used to recognise restaurants outside of the academy member’s home region. At least 30% of the panellists from each region change each year. In this competition, only four Australian restaurants feature in the 100 best. The only one to make it into the top 50 is Attica (32) and Vue de Monde doesn’t feature at all. Instead, Brae, at Birregurra in the Otway hinterland south west of Melbourne, ranks 87th. Brae’s Dan Hunter has been picking up local awards too. He was named 2016 Chef of the Year in both The Age Good Food Guide and Australian Gourmet Traveller magazine. In Sydney, Tetsuya’s misses out, but both Quay (58) and Sepia (84) feature in the list. The lists don’t agree at all on the best restaurant in the world. Elite Traveler’s pick, Alinea in Chicago, comes 26th on the Best 50 list. Celler de Can Roca, in Girona, Spain is Best 50’s number one, but number five for the rich list of Elite Traveler readers. I’ve only eaten at one of these illustrious Australian establishments. 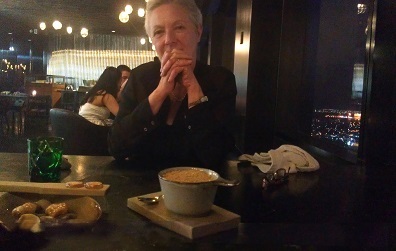 Our dinner at Vue de Monde was a mix of theatre, playfulness and great technique. The menu was distinctively Australian; “A high percentage of our customers are overseas visitors,” they confided. We ate animals and bits of animals we’d never tried before, shepherded through the process by staff who were never condescending or over-familiar. The menu didn’t waste words. It read: *Oyster *Wallaby *Smoked Eel *Lamb Heart *Duck Tongue *Barra Collar *Barra Head *Lamb *Beef Bone *Egg *Marron *Ox *Corn. We opted for one wine every two courses and passed on dessert. Nonetheless, a miniature dessert arrived. In the true Australian tradition it was a Lamington. Now if that’s not enough to get a restaurant into the Top 50, what is?